As a second semester college senior only taking ten units and really only having class twice a week AND not working, I have a lot of time on my hands. So I'm taking on Pintrest, and generally telling the world about my life with this blog. Here's the first go at it! The original Pinsperation, It was a link to and ETSY item that is no longer available. I decided to put my own subtle spin on it. 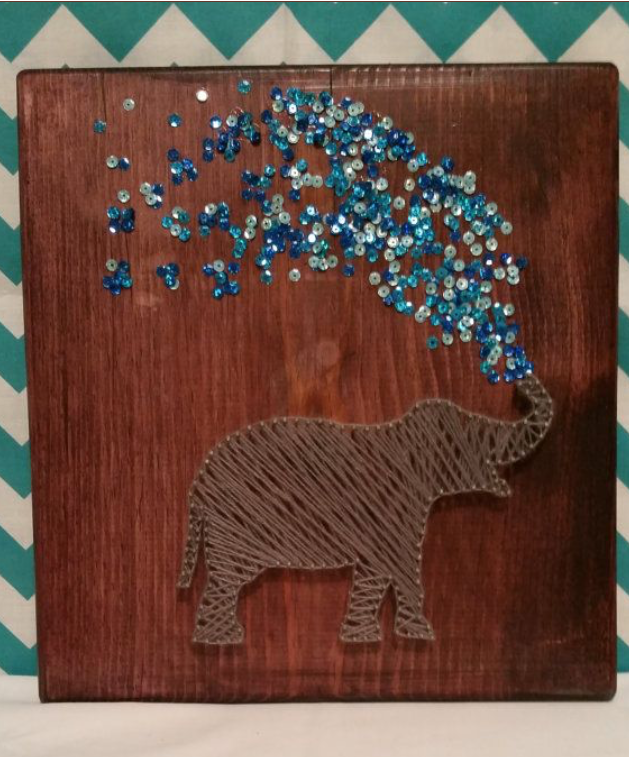 The supplies used (plus a 12x12 piece of wood, wood stain and a 4oz hammer) I traced the elephant used on the Pintrest post off my tablet to get a stencil for the nails. Putting the nails in was not an easy feat. It was not fun. I opened a beer, it got easier form there. There was a traumatizing moment somewhere in between here where I forgot to take the paper off before putting the string on the elephant. There was about two seconds of panic. Stomper is DONE! This took about three tries of figuring out how to put the string on (one of those still having the paper on there). There are two layers of string, I went at one angle and back at a slightly different angle. The finished product. Of course, I used A's colors instead of blues for the sequins. I used Mod Podge to apply the bulk of the sequins and just sprinkled them on. The outer sequins were individually glued with tacky glue. You can kind of see the knots where the string started and ended. It definitely turned out better than I thought. I was afraid for a little bit that it was going to turn into a fail rather than a success. Beautiful! I definitely want to try this for a christmas present. Can you explain a little more how you did the string part? Did you have multiple pieces that you just tied off at different spots? Hi Mae sorry to reply so late! If you did not have a chance to try this for Christmas, here is what I did incase you want to try it later! It is all ONE PIECE of string. It was all about finding the right spot to start and stop an then tying off at either end. It took me a couple of tries to get it right! Where did you find this template? I'd like to try it out. Thanks! Hi Katelynn! I actually made my own template by tracing the inspiration piece. I put a piece of paper over my tablet and traced with a pencil and then went over with sharpie. I added the dots and spaced them out based on the inspiration piece. Where did you get the 12 by 12 wood?? And the wood stain? The wood is just from JoAnn's and the stain is HomeDepot! I love your spin on the original piece. I just love elephants. Will definitely be trying this out. Thanks so much for the steps and supplies needed. what type nails do you use? 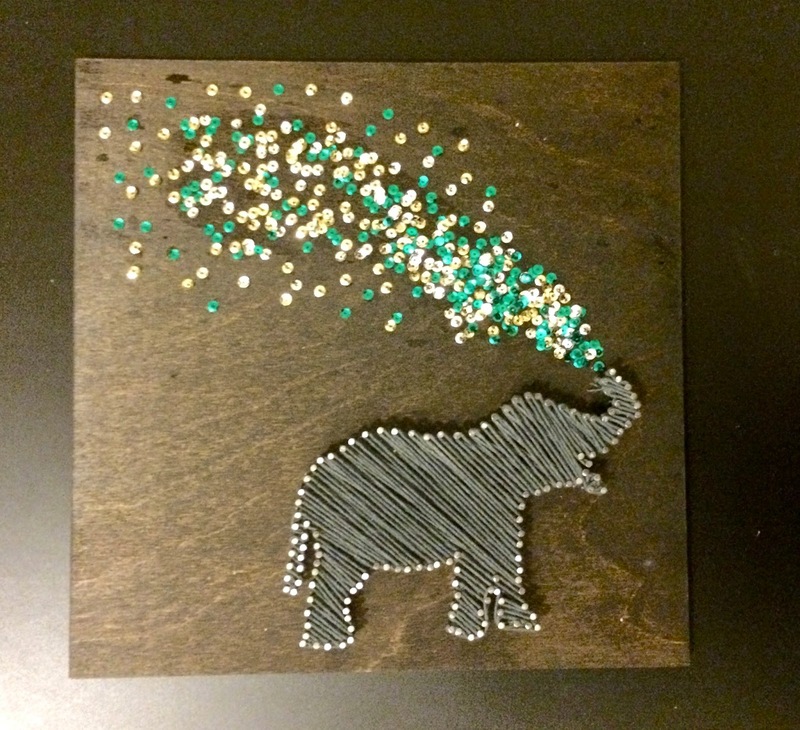 I've done several string art projects for Christmas presents this year. A little tip for anyone trying them, tap the nails in just to make a little hole and remove it. Do this on the whole outer edge, remove paper, then hammer in nails. Also, using pliers to hold the nails helps alot! Have fun! Love this elephant! Yours is better than the original! I wish you had kept up with your blog, you write well and do great with your Pinterest projects!